Over the past week I have nearly driven from nearly the Pacific Ocean to the coast of the Atlantic, raced in a quasi half-ironman in Boise, Idaho, watched more television in the past four days than I have in the past two year, listened to Adam Carolla’s new book called “Not Taco Bell Material” and hardly exercised at all. The plan was to come into the Boise 70.3 with a really good level of fitness and have a great day on the course. However, mother nature had a different idea of what the 70.3 would become. On race morning the temperature was cold, rain was pouring and the wind was blowing. Some say that the race officials even saw snow on some parts of the bike course. The end result was a shortened bike segment from 56 miles to just 14 miles, which was the distance from the swim course back into town where T2 was. (It was a point to point race) Even though I had pretty much everything I own in my car last weekend I was totally unprepared for the pre-race hours and just how cold and nasty it was. You see, the point to point setup made it such that you would drop your run bag off in T2 downtown (where my hotel was and where the race would finish) and then drive about 20-30 minutes out to the reservoir where the swim would be. On the way out to the reservoir I knew I was in trouble. I did not have a jacket to keep me warm and after I would drop off my gear on my bike I would literally have nothing to keep warm in until when my race started at 12:50, which was fifty (50) full minutes after the pro’s went off, and it was still raining and extremely cold with temperatures in the mid 40’s. Adding salt to the wound, in order to get up into T1 you had to climb a big hill that was nearly 3/4 of a mile. The first time I ventured out of the cocoon of the warm Athletes Lounge Xterra I took my bike, put it on my shoulder and made the trek to my spot. After debating how I was going to stay warm on the bike (at this point no change to the race had been made, for all I knew it was still the regular bike and regular race distance) which led me to making the decision that being warm for 56 miles was more important that having a fast transition. I opted to put arm warmers, a long sleeve shirt, vest and gloves in my bag. This ultimately would add to my dismal transition times. But more on that later. I will wrap up the pre-race drama by saying that after I put my winter apparel in my gear bag I made my way through the rain all the way back down to the car. I then cranked up the heat and sat in front of the heaters until 12:05. At that point I put on my wetsuit at the base of the hill and began to run up to the swim start. This would couple as my pre-race warmup and the only way to get my core temperature up. The only downside was that when I reached the top I still had about 50 minutes until my race started. You see because of the weather I would soon find out that the bike was being shorted (swim and run stayed the same) and the race start was pushed back about 10 minutes. This meant more time in the rain before the start of the race and a big wrench thrown into my race plan. The pre-race period like I said was cold and standing in the rain for almost an hour while the other waves went off was pretty much as bad as it sounds. Luckily the morning clothes bag van stayed until after the last wave went off so I was able to wear socks and shoes right up until the point when my wave began to be ushered into the corral. The swim was fantastically cold. I thought that after spending almost an hour in the cold rain that the “warm” water at 52 degrees would feel like a bath. However, I was mistaken as the water felt like an ice bath. I was probably bobbing in the water for about 3 minutes before it was time for our wave to go off. I can honestly say that is the coldest I have ever been in the water. It took until at least the second buoy before I felt the effects of churning arms begin to warm me. The swim overall went pretty well despite the cold temperatures. Really the main challenge was avoiding all the traffic from the waves of age groupers ahead of me. After the first right hand turn I locked onto some feet and stayed with him for the remainder of the swim. Everything good about the swim was quickly negated by the horrific T1 time I had. It was an absolute cluster f*&% due to the fact that my hands just wouldn’t work. My brain was telling them to put on my shirt, buckle my helmet and strap my bike shoes tight but the hands were so cold that all dexterity had been lost. I literally spend 2 extra minutes in transition due to this. I also decided that dropping my bike off the rack and onto the ground would be a good idea. Ugh..it was brutal and ended up being the difference between an 8th place amateur finish and a top 5. None the less I did my best on the bike to make up any time I could. Since it was now only 14 miles the plan became, “go as hard as you can”. I am happy to say that I was pretty much on par with most of the pros splitting just over 33 minutes. This included a stop right after I went over the timing mats to tighten my bike shoe and a good deal of coasting due to crowded roads from the age groupers ahead of me. T2 was like T1. I had a very hard time getting my sneakers on even with laces that didn’t need tying. I was just really struggling getting the heal of the shoe over my own heel for some reason. Again I gave away at least a full minute because of this. Onto the run course I went. Again since this race has been drastically shortened I really didn’t have a game plan as to what I wanted to do with my run. While on the bike I figured that I would start out around 6:00 min/mi pace and go from there. I covered the first mile in 6:00 minutes and felt pretty good, with the only exception being that my feet were like bricks. I mean they were FROZEN. It wasn’t until the second loop that I regained feeling in both feet. Over the first loop I mainly chased a guy that came into transition right next to me (he was 24 and in an AG below me but we started in the same wave so we were racing for the same time). He came into transition about 5 seconds before me and was out of transition a good 45 seconds before me. Thus, over the first 5 miles I just kept looking at his back from a good distance. I ended up making the catch at about 5 miles in and proceed to run side by side with him until mile 9. We had a couple exchanges and finally at mile 9 I made some comment like “good racing man, whatever happens man thanks for the company”. I am not sure if running with him for those 4 miles was a good or bad thing because my avg pace was the highest during those but they were also the most difficult in terms of exertion for me. Its not the beginning so you are facing a bit of fatigue and it was still a bit far out to start giving it my all. Whatever the case may be it got me through the 4 miles in a good place and with just about 3 – 3.5 miles to go I began to pick up the pace. Things worked well for me after that. I pulled away from my run buddy and gave a good 5k effort to the finish line. …and then this happened. As I was coming down the finishing shoot I happened upon the man in the blue tank, yeah the guy with the crazy face. As I came up from behind him (I was running faster than him at that point as I was from a later wave start and I was just hustling to the finish line to try and get there as fast as I possibly could) he decided it was a life or death situation and rather than “fight” he was going to take “flight”. 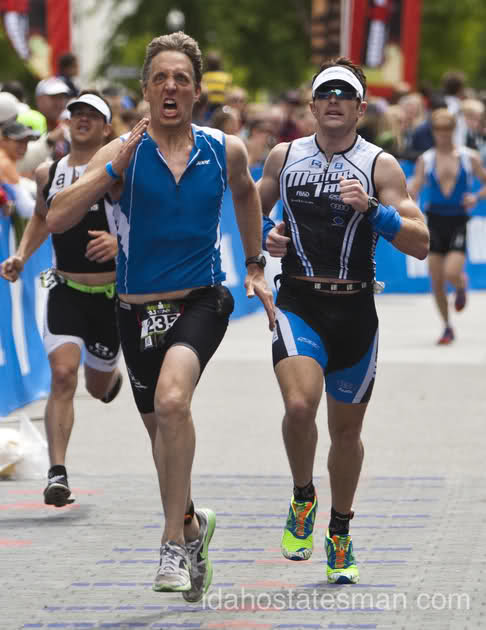 It was as if he took personal offense to being past in the final 100 yards of a race. I wasn’t really all about having a sprint off finish with some guy not in my AG who started at the very closest 5 minutes before me. Despite my pained expression in the background I wasn’t really hurting all that much. Truth be told I was a bit ticked off that this was how the finish ended up for me, but once I saw this picture all that was wiped away from my mind and replaced with joy. Joy of making this guy look like that. This photo is priceless and I hope you all can enjoy it as much as me. At the Boise 70.3 finish line. Just look at that determination on his face! All in all I was very pleased with my individual splits from the race. If I had not screwed the transitions up so badly I would have been much higher placed. For that I am disappointed in myself. I should have prepared myself better for the situation at hand. For instance Matty Reed, the eventual co-champion wore his wetsuit on the short 14 mile bike ride both keeping him warm and making T1 FAST! It’s things like that I need to take into account. And yes, I was pretty bummed the bike portion was shortened by so much since cycling has been a big focus this year. It ultimately made the Boise race into a track meet. I did have my PR at the 13.1 distance but did it on only 14 miles so I really can’t count that. The bottom line is that some guys can pop off 1:11 – 1:15’s and that is what it takes. I don’t have that speed in my legs yet, but there is still time. If anything the fact that this race became a bit of a mess only adds fuel to the fire. I am excited to get back to training and cannot wait for the rest of my races this season. First up will be my hometown half ironman, The Musselman in Geneva, NY. I have a lot of work to do as taking a week off from training coupled with driving a lot and eating sub optimally has left me feeling a bit “soft” to say the least. Hopefully spending a few days on the Long Island Sound training and spending time with my Grandmother will get me back in the swing of things. And even if that doesn’t I know that once I get to Lake Placid on Thursday it will be all business. that’s the best finisher’s photo ever! yeah, in truly takes the cake. That kind of determination, fear, whatever you may call it just can’t be made up. Yo, man… hell of a race report. Congratulations on the finish. I have been known to accidentally drop my bike during transition as well. I am happy to hear it happens to more than just me. Look forward to seeing you at Mussel.